World's Top Travel Destination. Quality of Life & Most Peaceful. Where Will You Buy a Holiday Home, Retire or Invest for Rental Income? Meet the team in person, 13-14th April, 2019 at the RDS, Dublin, Ireland at The Overseas Property Show, who have all flown across from Portugal for this event. They'll be glad to discuss your individual requirements and provide invaluable information on the property market in general, and also help create a tailored plan of action to make your dream of owning a property in Portugal a reality! Everyone you meet at the show is a permanent resident in Portugal, mainly the Algarve and Lisbon areas and have in-depth local knowledge of the property industry, culture and what's going on. The show is a personal and enjoyable way to learn from the experts, in a comfortable environment where you can freely ask about anything that may be of concern. You can discuss the various ways to organise your property viewings, and find out all about the services on offer to make the next step towards your dreams as cost effective as possible and with an element of fun! You'll be introduced to the viewing trip experiences which have proven to be hugely successful for our clients. Our aim is to get you know you as a person, your likes, dislikes and hobbies. From there we can help you research the right areas and available properties that would suit you most. With years of experience in the business, we have a vast network of contacts locally including partner agents, developers, lawyers and currency brokers. With access to a wide variety of properties in all price ranges we're sure to have a great selection ready for you to visit! Visit us at the show and start your journey, get to know us personally and meet with us again when you fly over to take a look at our portfolio up close. Nestled in the westerly corner of Europe with hundreds of golden beaches that overlook the Atlantic Ocean, Portugal is one of the easiest to reach of our featured locations from the UK. With it's warm climate and people, easy access and natural charm, Portugal remains a firm favourite for property buyers. Moving to Portugal to live is often a long-held dream come true for the expats who live here – a life that is full of outdoor activities, fine foods and traditional values. Portugal is a modern country with a European lifestyle that can seem much more relaxed compare with the hustle and bustle of the UK. Most visitors arriving at busy Faro airport on Portugal’s ever-popular Algarve coast head west towards buzzy golf and beach resorts such as Vilamoura and Portimao. However head east and within forty minutes the Guadiana River forms a natural border between Spain and Portugal. This eastern Algarve offers a quieter, calmer alternative of red-roofed towns under shaded pines. 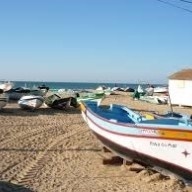 “The eastern Algarve has historic towns and is more affordable than the west. Property is more expensive than in Spain but advantages of buying in Portugal include no inheritance tax and substantially lower buying costs. A good quality two-bedroom apartment in the eastern Algarve would be around €165,000 and a townhouse closer to €190,000.” If you opt to buy in Spain, cross the impressive Guadiana Bridge to the Costa de la Luz, a long windswept coast popular with Spaniards and windsurfers and backed by dense pine forests. Local treats include white prawns, pata negra - Serrano ham – and Condado region wines. 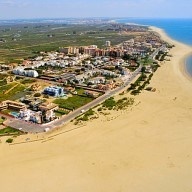 “Costa de la Luz has always been Spain’s best kept secret. Yet Faro airport in Portugal is under one hour and Seville in Spain is 80 minutes from where the high speed train takes just over two hours to reach Madrid. This part of Spain still retains the charm of a laidback lifestyle with generations of local families meeting in town squares.” Immediately across the border in Spain, Isla Canela is on a 4,200-acre island with a nature reserve stocked with flamingos and eagles. The resort was established twenty years ago and has sold around 4000 properties to mainly Spanish, British and Scandinavian buyers. It has an 18-hole golf course, marina, hotels and shopping centres with completed apartments priced from €89,000. More than a home in the sun. Discover what a life with quality really means. Portugal Property Show is wholly owned and licensed by Ideia Fabulástica Mediação Imobiliária Unipessoal LDA. A leading and award winning real estate agency based in Portugal with offices in the Algarve, Lisbon and Spain.